We are delighted to present our new showroom refurbishment. A refreshed, contemporary look with artisan finishes and a show stopping La Cornue Chateau 165 G4 with copper trim centre piece. There are lots of things we keep in the fridge that would be better stored elsewhere. What would you squirrel away? With our Swedish heritage at Figura, a Tomte at Christmas is a prominent figure. Artists are looking beyond a home’s four walls and living rooms to make an artistic impression. Avant-garde and one-of-a-kind works of art are now making their way into our kitchens. Accessed through a discreet pair of wardrobe doors in the adjoining bedroom, this is a wonderfully luxurious en-suite. Including bespoke furniture, panelling and mirrors. Asapragus harvesting season started yesterday and continues through to summer solstice on 21st June...enjoy! Spring, the sweet spring, is the year’s pleasant king, Then blooms each thing, then maids dance in a ring, Cold doth not sting, the pretty birds do sing: Cuckoo, jug-jug, pu-we, to-witta-woo! These buns are happy, they've been baked in a gorgeous Figura kitchen....with love! Beautiful aged oak writing desk in this bespoke, period kitchen. The perfect location to pen a note to your loved one. This easy pancake recipe is wonderfully simple and perfect for cooking with kids. Make up a big batch for Pancake Day and get flipping, but make sure you don't get them stuck on the ceiling! Wishing everyone health and happiness.....just like these wonderful vegetables in one of our beautifully designed kitchens.....2018 right here! Start this Christmas with F! Family, Feast, Festivities, Figgy pudding, Flocks, Food, Frankincense, French hens, Frosty, Fruitcake......Figura! Merry Christmas and a Happy New Year from all of us. Christmas (or Plum) Pudding is the traditional end to the British Christmas dinner. But what we think of as Christmas Pudding, is not what it was originally like! Nothing better at this time of year than a brisk walk out in the fresh air of the Surrey Hills and then back home to warm up by the AGA. Proper hot chocolate is one of life's great joys and ought to be in everyone's culinary repertoire. November is awash with hearty root vegetables that love a nip of frost. It also turns out that 'National Fig Week' is the first week in November....so we have brought a dessert recipe below to celebrate! Pumpkins are the most famous of all the winter squashes, and are most associated with Halloween lanterns. Inside the hard orange or yellow skin, the bright orange flesh is sweet and honeyed. In pursuit of our passion for delivering excellence we will be regularly showcasing creative and skilfully executed recipes, which focus on purity of flavour and reverence for seasonal, quality ingredients, all elements that are closely aligned with our own ethos. 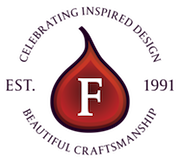 With a focus on fashion, or in other words 'a popular or latest style', it got us thinking about kitchen and interiors design trends and how Figura chooses to favour design and function over latest fashions. July, named after Julius Caeser is on average the hottest month of the year. There are plenty of things happening to take advantage of the warmer weather and longer days. Vrroom vroom... Come on June! May is gone… And June is here… Wonderful, This time of year. According to old superstitions, it is unlucky to marry, buy a broom or wash a blanket in May, so with all that free time, what could we be getting up to? Let's forget the fools and the showers and focus on the all the great things April has to offer, starting with Easter bunnies, there is also beer, bicycles and Hot Cross Buns. So Spring is finally here we all cry....but is it? According to the weather experts spring can start at different times, depending on who you ask. So, February......it's cold......but thankfully the shortest month of the year and Spring is teasing us around the corner.